There’s been an influx of dining options in the area in the last 6 months. Is it the economy? Is it changes in people’s tastes? We have The Blind Boar and Tutti Giorni in Norwood. 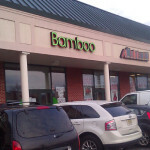 There’s Biddy O’Malley’s and now Bamboo Sushi in Northvale. Plus there’s Sear House and Zendiggi Kebab House in Closter. Ladies and Gentlemen, it appears the “American Dream” is alive and well in Bergen County. Mom’s Cooking comes via New York City serving homemade soups, sandwiches and platters. Food is labelled as Vegetarian and Dairy, which should help those with dietary restrictions. Menu board of today’s available choices. They change daily. Sandwiches, Salads & Soda (Say that 5 times real fast) ready-to-go!